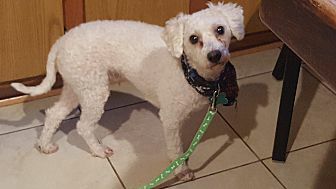 Sebastian is a very fearful, yet curious 14 pound -2 year old poodle that is a challenge to say the least. 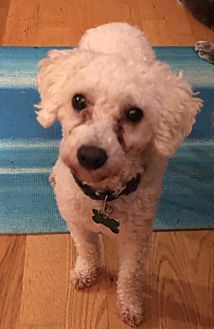 Believed to be a puppy mill dog, Sebastian missed out on any socialization or human contact during the critical development period of early life and is therefore TERRIFIED of human touch. It is unknown as to his exact history but it is certainly clear that he is anxiety ridden when it comes to new places and people. 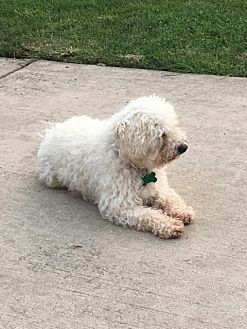 Upon coming to his foster home this poor guy was a shaking, matted mess that had to be taken directly to the vet where he had to be sedated and then put under anesthetic in order to examine him and to shave him down as he was no doubt never groomed. Once back at this foster home, this little guy stayed in a gated area refusing to come out of the corner for 3 weeks. After gaining a bit of confidence from the other household dogs he began to venture slowly out into the rest of the house but always panicking and running under or behind anything available whenever his foster mom made a move. After 5 weeks he gained confidence with the other dogs and took his place among the pack being the scared and submissive one of the group. Always observant and watchful, he learned from the other dogs how to be a dog and relies on the others to show him what to do and how to react. It took 7 weeks before this little guy was curious enough to follow the other dogs and walked past his foster mom as she held the door open to go outside. Terrified at first, it was clear he had never been allowed such freedom. Being outside for the first time, he darted for the door and back inside several times before he was sure he was safe. He will now go in and out of the house comfortably but is not yet totally housebroken as he doesn’t demonstrate or vocalize the need to go out but will follow the other dogs whenever they go out. For this reason he would do best with someone that is patient and schedule orientated that would be at home the majority of the time so help with his training. He does require a fenced yard as he could be a door darter and since he won’t let you handle him a leashed walk is out of the question. Since gaining a bit of confidence, Sebastian has developed into a playful pup with the other dogs and would do best with at least one playful companion dog. He loves to stalk, run at and jump on the other dogs and will initiate play by nipping at their faces or hind legs. He is submissive with the other dogs and will roll belly up letting them know that they are in charge. Since he has just gotten the hang of playing, he still will not interact with humans or other toys but will resort to chewing up his bed if he is left to long play and entertain himself. He is certainly making up for the puppy he was never allowed to be. Sebastian sleeps uneasy, almost as if he has one eye open and jumps out of bed if he even senses anyone walking too near him. He will now come to his foster mom (after 5 months) and take treats out of her hand as long as she doesn’t make any attempt to pet or move towards him. He will greet you at the door, along with the other dogs when you come home - just don’t touch him! He has found his bark and will bark at the door to come in (never out) and sneaks up to sniff you as long you don’t move. If accidentally touched or brushed by a hand of food he just about jumps out of his skin and retreats to a safe distance that will allow for a fast getaway should he feel threatened. Sebastian needs a fairly quite, ADULT ONLY household as children move too quickly, scare him and he will bite if he feels threatened or cornered. He would do best with an in house training one-on-one program and medications to overcome his anxiety and maybe, he just may be one of those dogs that will never warm up to human touch allowing himself to cuddle or be loved. One thing is for certain and that is he needs a very patient and practiced owner that will love him AS IS and work with him to become his true potential of what he can be. 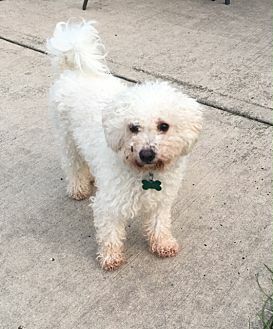 If you are that experienced, adult pet owner that has the time, patience and the funds to invest in behavioral training, medications and the commitment to helping him and would like to meet Sebastian, contact his foster mom Cindy at 708-655-9620. He is up to date on his shots, been neutered has been heartworm tested and is flea and tick protected. His adoption fee is $100.